This is something I've wanted to do since July last year but I felt it weren't the best time to do it which is why I was so excited for the New Year! As I didn't start blogging properly until July last year, every month I created a post of my summary of each month blogging wise and life wise of what went well, what didn't go so well and my goals for the next month. This is something I may also continue with too now we are into the new year! I absolutely love the New Year as it's a chance to start fresh with new goals and more realistic ones too; the goals we're actually going to stick too and not break after the first day. Today I'm going to be sharing with you my long term blogging goals for 2017; the big ones, the ones which are going to take at least 12 months to reach and I'm so excited to try and hit them. A quick disclaimer; I don't blog for how many followers I have, it's not a big deal. I could have 10 or I could have 10,000; I would still love blogging as much as I do now as it's something I enjoy, it's a hobby. But something I want to do is grow my blog, to reach out to more of you and to make another person smile each day. My biggest blogging goal this year is to blog everyday. If you've been a reader of my blog since the very start then you'll know I blogged every single day from September 1st to December 26th (I then took a four day break before the New Year). This was my biggest achievement for my blog in 2016, it weren't planned, nor was I expecting to blog everyday. It just happened and I'm glad it did as I thoroughly enjoyed it. So after spending a few days umming and urring I've decided I'm going to blog every single day in 2017. This might work, but this also might not work but it's a challenge and I can't lie, I do love a challenge. However, it will be an exciting experience and I'm so excited to be sharing it with you! Another area I want to improve is my photography. I'm always so up and down with how I feel about my photos. Some days I absolutely love them and wouldn't change them for the world, whereas other days I cannot stand them and feel so down about it. As I'm writing this I have ordered a studio light and it's arriving within the next two days. It's a start and I'm looking forward to experimenting with it to see how I can adapt my photography so I'm finally 100% happy with how my pictures look. One thing I don't want to change about my photos is how basic and simple they are. 3. Instagram - 1,500 followers. Instagram is another area which is obviously going to change if my photography does but I'm currently half way to the goal I want to reach by December so I feel this goal is achievable (as long as Instagram doesn't mess up). I never thought I'd ever be able to grow a following on my Instagram, so to already be half way to 1.5k followers, I'm already so pleased with how everything's currently going. If you don't follow me on Instagram but would like to, my username is @_KimberleyJessica. 4. Twitter - 10,000 followers. 5. Bloglovin - 750 followers. Another goal which may possibly be achievable is to reach 750 followers on Bloglovin. I've found Bloglovin to be one of the most difficult accounts to follow. I guess if you don't have Bloglovin then you can't follow someone, so it's a right pain and a reason why so many people don't follow you who may follow you on your other accounts. I'm also very close to 400 followers right now so there's not far to go till I reach 750, but to reach it will be an accomplishment. 6. Facebook - 300 to 500 followers. Another account I have also struggled to grow in 2016 is Facebook. I haven't had the account long but it's been difficult to get past 30 likes (however I did gain over 60 in the past day). It's going to be a challenge to reach my goal which is why I've made it between 300 and 500. If I hit 300, brilliant but if I hit 500, that would be incredible! This is another account which I try to update on a daily basis. 7. Page Views All Time - 150,000. Last but not least is my blog views. I know this isn't a big deal but when you look at your stats and see how your blog can receive however many views a day, it's a pretty incredible feeling. It's definitely one area of my blog which makes me smile a lot as I never thought I'd hit 1000 page views of all time when I first started blogging. It's nice to dream, even if it's for a little bit, right? If you want me to carry on with my monthly thoughts and outcomes, let me know! 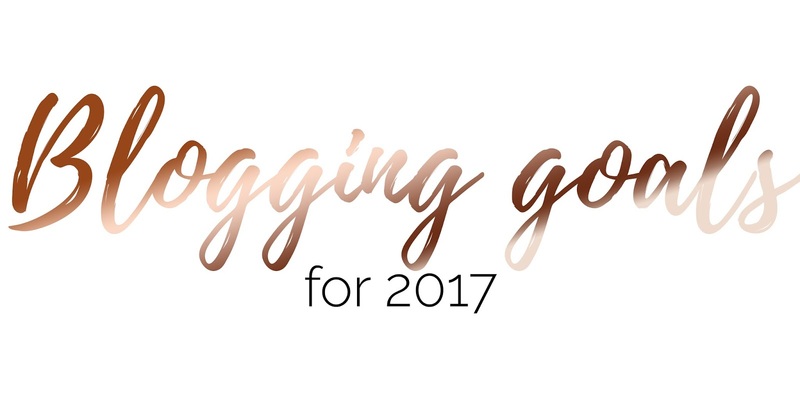 Have you got any blogging goals you really want to smash this year? Blogging every day? Wow I don't think I would be able to do that! I have the same sort of goals as you! Great post!